Daniel A. Binchy’s Corpus Iuris Hibernici, published in 1979, set the seal on a lifetime’s work that had made him the acknowledged leader in Celtic law studies. Earlier in his career, however, Binchy edited the proceedings of an Irish law of women seminar. This volume spurred the formation of a 1970 Board of Celtic Studies seminar that studied the Welsh law of women. 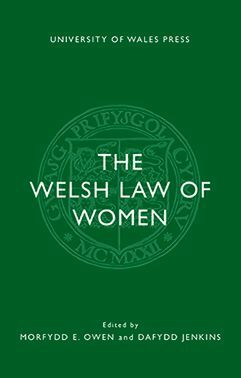 The Welsh Law of Women, edited by Morfydd E. Owen and Dafydd Jenkins, provides a detailed and documented account of one of the most illuminating tractates in the Welsh lawbooks. This book comprises six studies dealing with various aspects of the Welsh material, texts of three versions of the tractate—one in Latin and two, both based on manuscripts not previously printed, in Welsh—with English translations, a glossary, and indexes. This new edition also includes a preface by Morfydd E. Owen, who edited the original volume with Dafydd Jenkins, surveying work in the field since the first edition in 1980.